George Springer became “The Headless Hero” at Dodger Stadium Wednesday night. 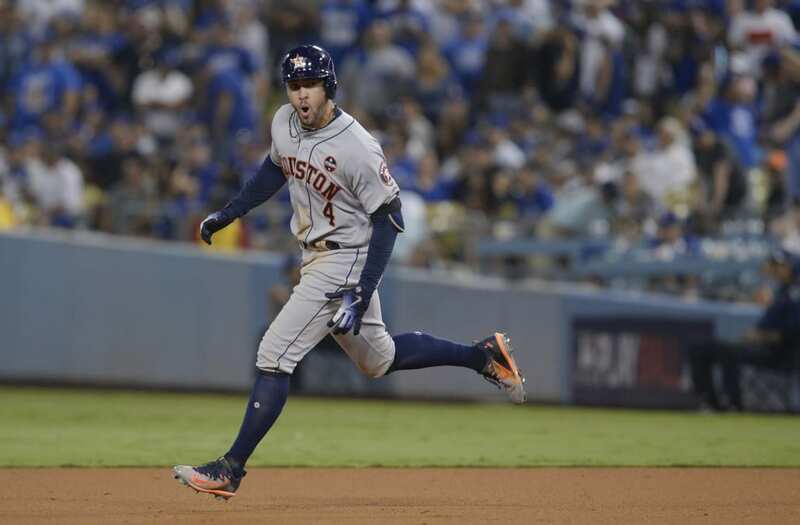 The Astros centerfielder had himself to thank for the Game 2 heroics, as Springer’s two-run homer in the 11th inning lifted Houston to an eventual 7-6 win over the Dodgers in the World Series classic. But credit for Springer’s bizarre mid-game “decapitation” can go to a little company called Mastercard. With the score tied at one in the bottom of the sixth, Springer trotted toward right-center for a routine flyball when a black CGI advertisement for Masterpass that covered a section of the outfield wall also swallowed Springer’s noggin on the Fox broadcast. It made for an odd visual — about as close as a real game gets to a video game glitch. Springer, of course, survived Mastercard's campaign. But it took another five innings for his night to become, well, priceless. Anyone watching the World Series have the YouTube logo on the backstop messing with them? #FoxSports remove the you tube ad behind home plate-the red arrow logo too distracting!